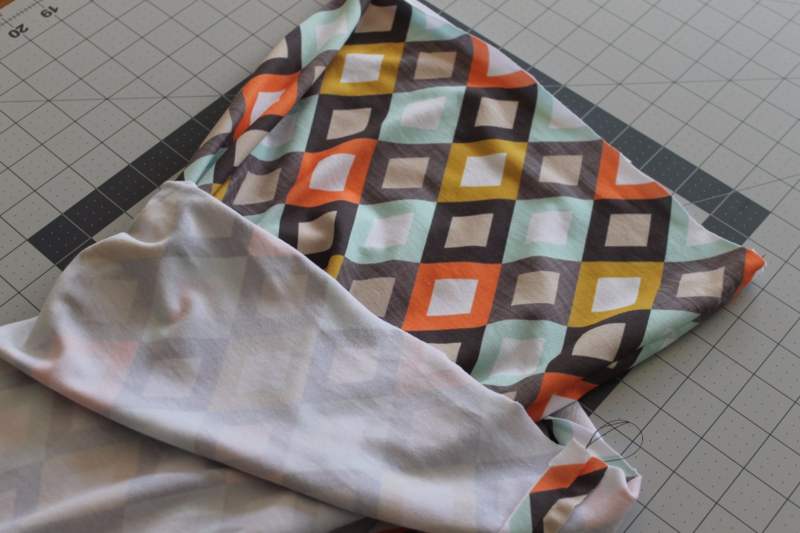 For this scarf, you’ll need two yards of Spoonflower’s new Modern Jersey (56 inches wide). You can make two scarves with this yardage, but note that you cannot make one scarf out of one yard. You need to make full use of the length that two yards gives you, to make a scarf. 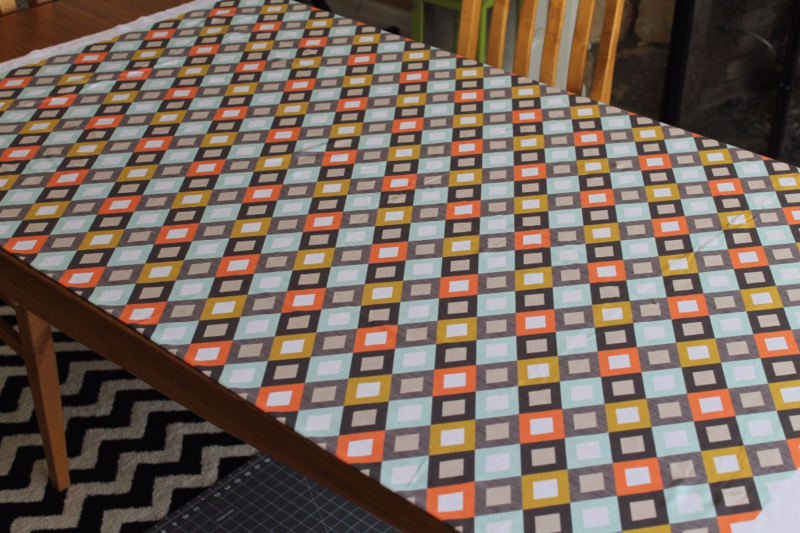 You’ll also need to work on a large table or even a hard floor so that you’re able to fully lay the fabric out. You don’t want the fabric to hang over the edges of a small, narrow work surface, as the weight of the overhanging fabric could pull the rest of the fabric down and you won’t be able to cut straight lines. Lay your two yards of jersey on your work surface folded in half with the wrong sides facing (I used Linen diamonds by Mrshervi). The fold will be along the imaginary 1 yard line, so you have one yard of fabric laying on top of the other. 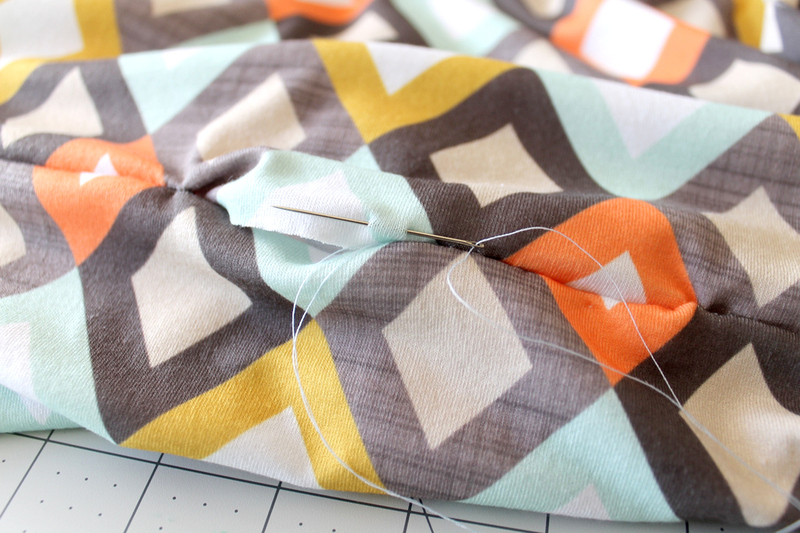 Find the halfway mark perpendicular to the fold you just created and cut the fabric in half. If you have a patterned print like I do, it’s best to cut one layer of fabric at a time, following the pattern for a straight line. 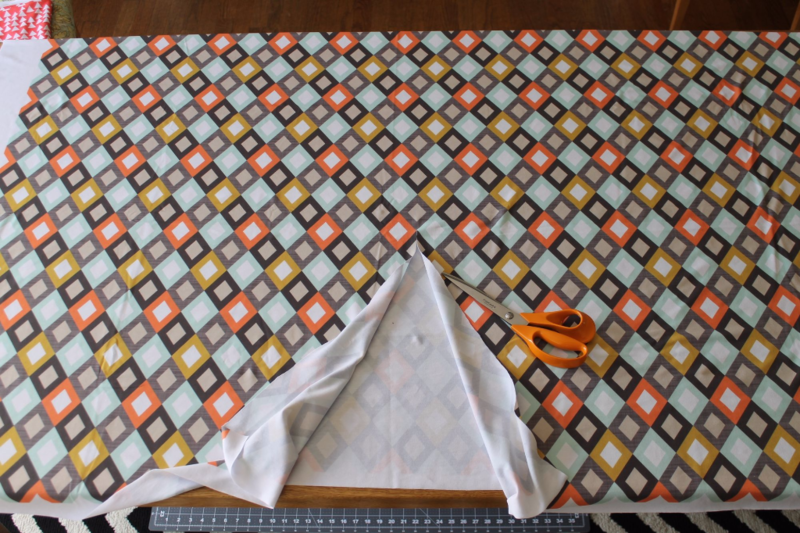 You will now have two separate cuts of fabric each measuring 72” x 28” and each can be sewn into a scarf. One for you and one for a friend! Next, trim the excess white fabric at the edges of the print. I recommend saving these for future sewing projects; they are great for sewing sleeve cuffs or neckbands on tops and tees. 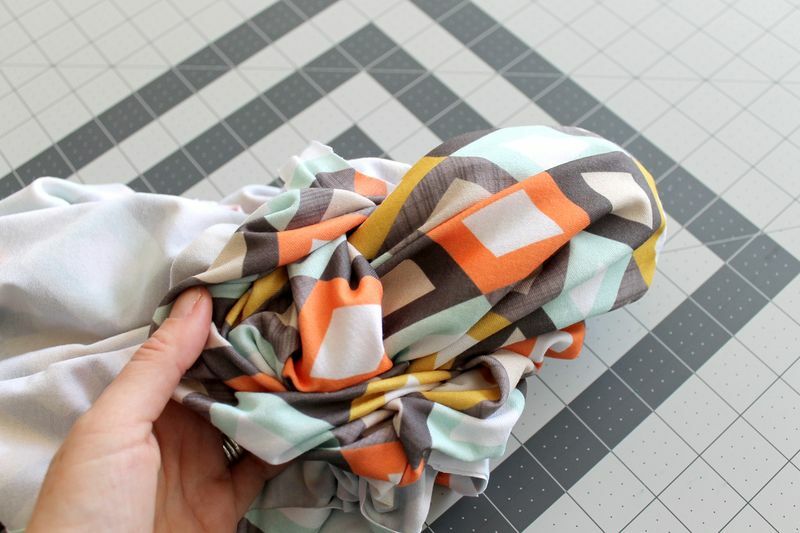 Take your fabric and fold in half lengthwise with right sides together. 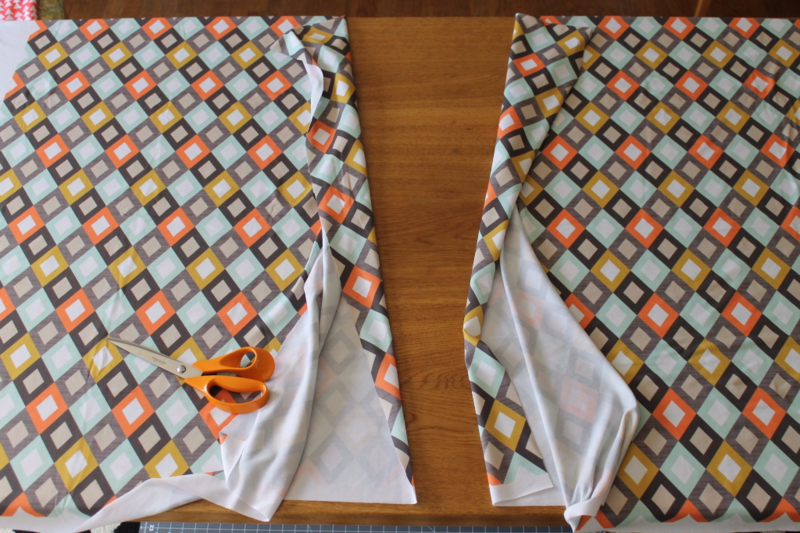 Pin the two long raw edges together and sew down the entire length to create a long tube open at both ends. Keep the tube inside out with right sides together. Now, bring one short end up towards the other by rolling the right sides of the fabric against itself. It’s probably easiest to reach down into the tube, grab the bottom edge with your hand, and pull that end back up through the tube and match up the two raw edges. Pin the two edges together around the circle, matching up the seam. When pinning, leave a 4” hole that will remain unsewn. To remind myself not to sew over the hole, I place my pins in an X shape either side of the hole I want to leave, and start/stop sewing at those marks. Sew. You’re almost finished. Turn the scarf right sides out through the 4” hole you left. You’ll be able to pull the entire thing through the hole. Machine stitch (or hand stitch for a neater finish) the hole closed. You’re done! 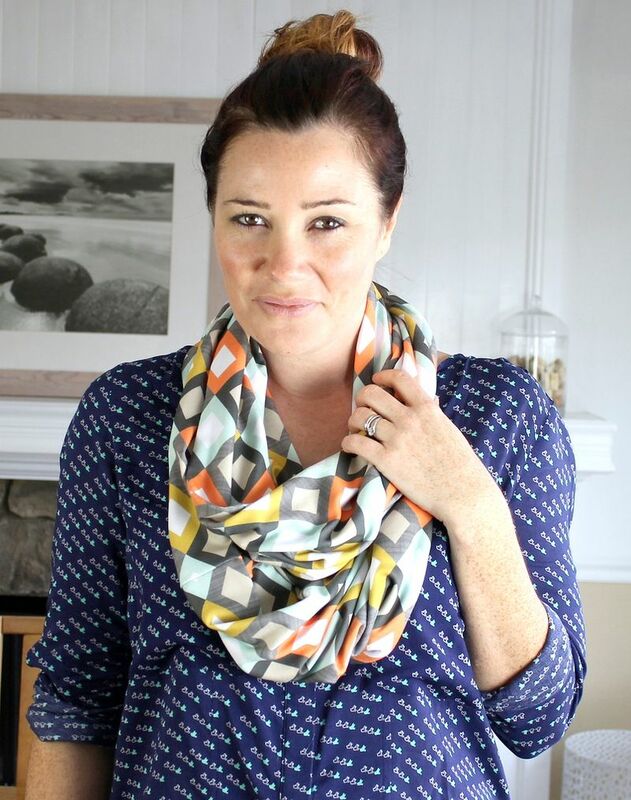 Your scarf can be worn loose by looping twice around the neck, or more snugly by wrapping three times around. Enjoy! 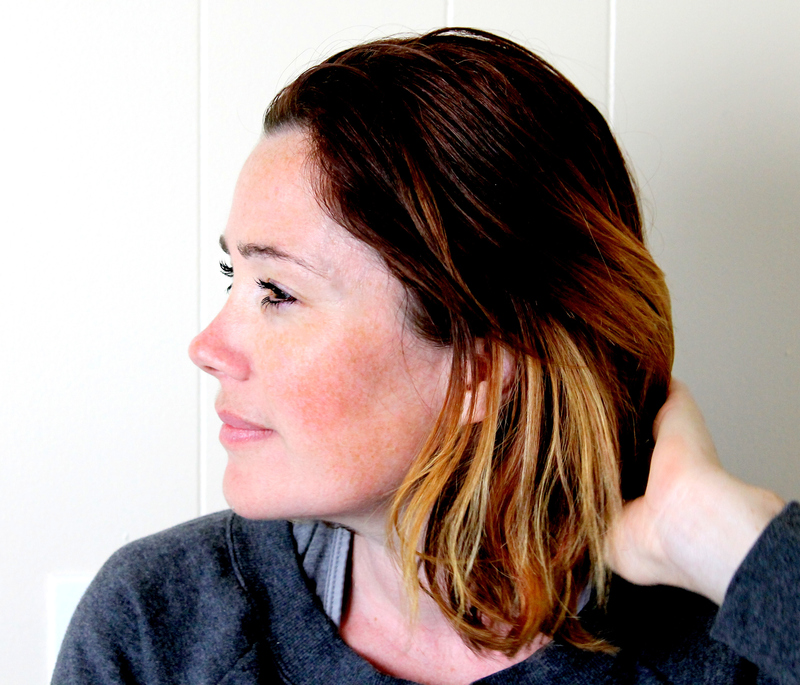 Looking for more quick beginner projects? Try this one. 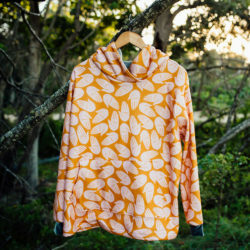 Can you give any tips for sewing knits/jersey? What kind of needle, sewing machine tension, stitch length, anything that might be out of the ordinary? A ball point sewing machine needle is a must. Also, I was always told to stitch with a very narrow zig zag, offering a bit of stretch at the seam line. So, is the finished cut dimension 72×18″? Or less after cutting off the white excess? Thx! Beautiful fabric and design. Looking good for an infinity scarf. Thanks for sharing this tutorial, making one for yourself, truly you can make what you want, based on your preference. Brilliant idea to turn a modern jersey into a inifiti scarf. I abolutely loved this tutorial and thanks for showing how to make this beautiful scarf. I have to tell you: I looked at at least 4 other tutorials and yours is the only one I could make sense of. Very clear instructions, very helpful pictures. thanks Leslie! We’re so glad to hear this tutorial was easy to follow along with! Happy sewing! Glad you enjoyed it! We’d love to see what you create! We agree! “One for me, one for you” is our favorite sewing philosophy! 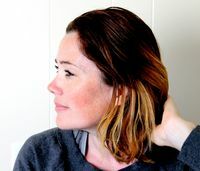 Hey Alicia, there was actually a typo in the tutorial — the finished cut dimension for each piece should be 28″ x 72″ after cutting the selvage. Sorry for any confusion! 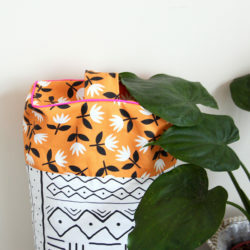 I’ve sent my bestie over to pick her fav patterns, my plan is to get her hooked on Spoonflower! I’ll be making her an infinity scarf for a Christmas present. Possibly a few tea towels of her fav drawings by her children too. 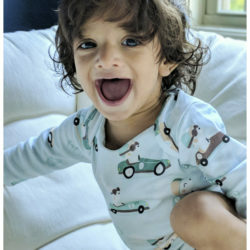 Thank you for the two tutorials! I LOVE Spoonflower! If I am using non stretchy knit– do you know if the same dimensions will work? yes, the dimensions remain the same for wovens as well as knits!